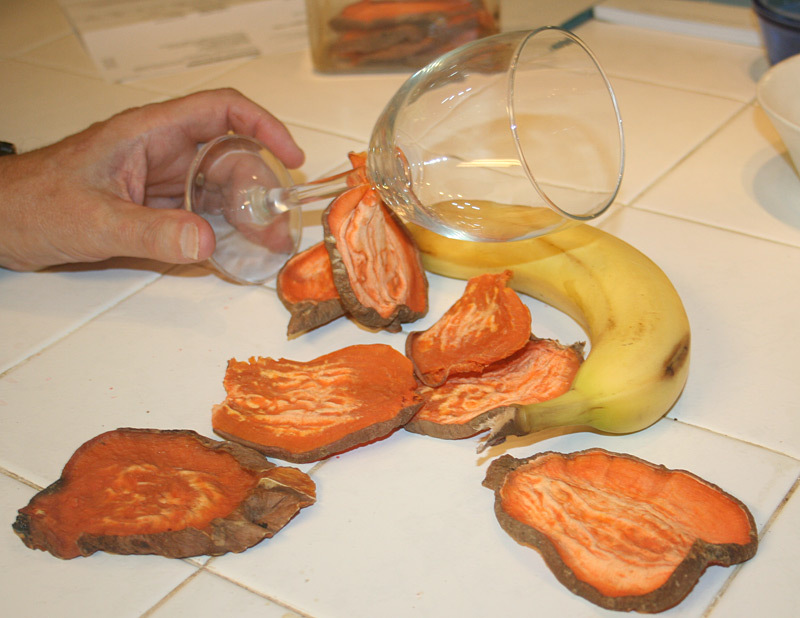 Who knew dehydrating could be so much fun? Thanks, Joan! Last night I loaded it up with bananas, strawberries, blueberries and kale. The kale and the strawberries shrunk a lot, the bananas not quite so much, and the blueberries not at all. Tonight, eggplant bacon! This entry was posted on July 2, 2014 at 7:50 am	and is filed under No beagle content. You can follow any responses to this entry through the RSS 2.0 feed. You can leave a response, or trackback from your own site. Way to go. I have not tried eggplant. I am growing some this year and will have to try it. What a great picture ! I love it. Love the “artsy” touch of the wine glass. Would you suggest red or white with the sweet potatoe chews ? LOL Laurie- you have to quit your day job and open up a photography shop / dog day care – camp that also sells dehydrated goodies. What do the boys think of the Sweet Potato Chews? How do they taste? I love roasted sweet potatoes in olive oil.